Shepard named his space capsule Freedom 7, setting a precedent for the remaining six Mercury astronauts naming their spacecraft. The number 7 was included in all the manned Mercury spacecraft names to honor NASA's first group of seven astronauts. His spacecraft reached an altitude of 101.2 nautical miles (116.5 statute miles, 187.5 km) and traveled a downrange distance of 263.1 nautical miles (302.8 statute miles, 487.3 km). It was the fourth Mercury flight launched with the Mercury-Redstone Launch Vehicle,[Note 1] from Cape Canaveral, Florida, close to the Atlantic Ocean. The Freedom 7 spacecraft, Mercury capsule #7, was delivered to Cape Canaveral on December 9, 1960. It had originally been expected that a mission could be launched soon after the spacecraft was available, but Capsule #7 turned out to require extensive development and testing work before it was deemed safe for flight. However, as it had been earmarked since the summer as the first manned spacecraft, the decision was taken to delay the mission until this particular capsule was ready, with a tentative launch date of March 6, rather than use an alternative capsule. The booster originally intended for the flight, Redstone #3, had been delivered to the Cape in early December; however, it was then used on the MR-1A test flight on December 19. The replacement, Redstone #7, did not arrive at the Cape until late March; by this time, however, the mission had already been postponed to await the results of another test flight. In late 1960, there had been a growing number of concerns about the standards of the Redstone launch vehicle; the MR-2 test flight, "manned" by a chimpanzee, had had technical problems during the launch leading to the spacecraft flying too high, too far and too fast. As a result, the mission was two minutes longer than planned, and the re-entry subjected the passenger to 14.7g rather than the planned figure of approximately 12g. The splashdown point was sixty miles from the nearest recovery ship, and it was over two and a half hours before a helicopter could recover the capsule and its passenger – by which time it had almost sunk. As a result, NASA was unwilling to launch the MR-3 mission without further development work; by late February, there were still seven major alterations they had made to the booster which required testing. An additional testing flight was accordingly added to the schedule, MR-BD (for "Booster Development"; it was originally known as MR-2A). This would launch on March 28, pushing the MR-3 flight back a month to April 25. The MR-BD flight was almost completely successful, ensuring that the manned MR-3 flight could proceed without further significant delay. The pilot for MR-3 had been chosen several months in advance, in early January, by the head of the program, Robert R. Gilruth. He had selected Alan Shepard as the primary pilot, with John Glenn and Gus Grissom as his backups; the other members of the Mercury Seven continued to train for later missions. The three names were announced to the press on February 22 without any indication as to which of the three was expected to fly the mission. Shepard's name was only announced publicly after the initial launch attempt had been canceled, as Gilruth wished to keep his options open in the event that last-minute personnel changes were required. Glenn served as Shepard's backup on launch day, with Grissom focusing on training for MR-4, the next suborbital mission. The countdown began at 8:30 p.m. the previous night, with Shepard waking up and eating a breakfast of steak and eggs with toast, coffee, and orange juice (the steak and eggs breakfast would soon become a tradition for astronauts the morning of a launch). He entered the spacecraft at 5:15 am. ET, just over two hours before the planned 7:20 launch time. At 7:05 am, the launch was held for an hour to let cloud cover clear – good visibility would be essential for photographs of the Earth – and fix a power supply unit; shortly after the count restarted, another hold was called in order to reboot a computer at Goddard Space Flight Center. The count was eventually resumed, after slightly over two and a half hours of unplanned holds, and continued with no further faults. All of the delays resulted in Shepard lying on his back in the capsule for almost three hours, by which point he complained to the blockhouse crew that he had a severe need to urinate (because the mission would last under 20 minutes, nobody had thought to equip the Mercury with a urine collection device). The crew told him that this was impossible as they'd have to set the White Room back up and waste considerable amounts of time removing the Mercury's heavily bolted hatch. An irate Shepard then announced that if he couldn't get out for a bathroom trip, he'd simply urinate in his suit. When the blockhouse protested that that would short out the medical electrodes on his body, he told them to simply turn the power off. They complied, and Shepard emptied his bladder. Because of the position he was sitting in, the urine pooled somewhat underneath his back and with oxygen flowing through the spacesuit, he was soon dried out, and the countdown resumed. Mercury-Redstone 3 finally lifted off at 9:34 am. ET, watched by an estimated 45 million television viewers in the United States. Shepard was subjected to a maximum acceleration of 6.3g just before the Redstone engine shut down, two minutes and 22 seconds after launch. Freedom 7's space-fixed velocity was 5,134 miles per hour (8,262 km/h), close to the planned value. Ten seconds later, the escape tower was jettisoned. At the three-minute mark, the automated attitude control system rotated Freedom 7 so the heat shield faced forward ready for re-entry. Shepard was now able to take manual control of the spacecraft, and began testing whether he was able to adjust its orientation. The first thing he did was position the spacecraft to its retrofire attitude of 34 degrees pitch (nose of spacecraft pitched down 34 degrees). He then tested manual control of yaw, motion from left to right, and roll. When he took control of all three axes, he found that the spacecraft response was about the same as that of the Mercury simulator; however, he could not hear the jets firing, as he could on the ground, due to the levels of background noise. The secondary objective was to make observations of the ground from the spacecraft; returning the spacecraft to automatic control, Shepard found that he was able to distinguish major land masses from clouds easily, and could make out coastlines, islands and major lakes, but had difficulty identifying cities. He had problems working with the spacecraft periscope – early Mercury capsules had a small periscope rather than a viewing window – and had to abandon an attempt to change optical filters on it after noticing that a pressure gauge on his wrist kept bumping the lever that would have activated the Launch Escape System. Although the escape tower was long gone and pressing on the lever probably wouldn't do anything, Shepard still didn't want to risk it in case something unexpected happened. Under automatic control, the spacecraft had developed a slight movement as it passed through peak altitude; Shepard now switched into the "fly-by-wire" mode, where the pilot used a controller to order the automatic system to fire the rockets for the desired positioning, rather than manually controlling the individual jets. Adjusting roll and yaw, he found the pitch position was around ten degrees too shallow – 25 degrees rather than the desired 35 for reentry – and as he began to correct it, the timed retrorockets fired to send him into reentry. The retrorocket pack – strapped atop the heatshield and so requiring release before reentry – was successfully jettisoned, but the confirmation light failed, requiring Shepard to activate the manual override for the jettison system before it confirmed that the rockets were fully released. Shepard resumed fly-by-wire control after retrofire, reporting that it felt smooth and gave the sensation of being fully in command of the craft, before letting the automatic systems briefly take over to reorient the capsule for reentry. He then kept control until the g-forces peaked at 11.6g during re-entry; he held the capsule until it had stabilized and then relinquished control to the automated system. The descent was faster than anticipated, but the parachutes deployed as planned, a drogue at 21,000 ft (6.4 km) and a main parachute at 10,000 ft (3.0 km). Splashdown occurred with an impact comparable to landing a jet aircraft on an aircraft carrier. Freedom 7 tilted over on its right side about 60 degrees from an upright position, but did not show any signs of leaking; it gently righted itself after a minute, and Shepard was able to report to the circling aircraft that he had landed safely and was ready to be recovered. A recovery helicopter arrived after a few minutes, and after a brief problem with the spacecraft antenna, the capsule was lifted partly out of the water in order to allow Shepard to leave by the main hatch. He squeezed out of the door and into a sling hoist, and was pulled into the helicopter, which flew both the astronaut and his spacecraft to a waiting aircraft carrier, USS Lake Champlain. The whole recovery process had taken only eleven minutes, from splashdown to arriving aboard. The flight lasted 15 minutes, 22 seconds and the spacecraft traveled 302 miles (486 km) from its launch point, ascending to 116.5 miles (187.5 km). Freedom 7 landed at these coordinates: 27°14′N 75°53′W﻿ / ﻿27.23°N 75.88°W﻿ / 27.23; -75.88. It reached a speed of 5,180 mph (8,340 km/h). Following the flight the spacecraft was examined by engineers and found to be in excellent shape, so much so that they decided it could have been safely used again in another launch. 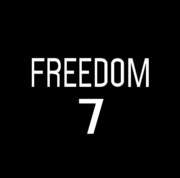 Given to the Smithsonian Institution by NASA, Freedom 7 was previously displayed at the U.S. Naval Academy in Annapolis, Maryland until 2012. Since 2012, it has been on display at the John F. Kennedy Library in Boston, Massachusetts. In June 1961, Laurie Records issued a 45 rpm single featuring William Allen and Orchestra entitled "Space Flight Freedom 7." It consisted of recreations of the tower to astronaut communications spoken over an instrumental backing. The Mercury-Redstone 3 mission was dramatized in Tom Wolfe's 1979 book The Right Stuff, Philip Kaufman's 1983 movie The Right Stuff based on the book (Scott Glenn plays Shepard), and in the HBO 1998 miniseries From the Earth to the Moon episode "Can We Do This?" (starring Ted Levine as Shepard). 00:00 Liftoff Mercury-Redstone lifts off, onboard clock starts. 00:16 Pitch Program Redstone pitches over 2 deg/s from 90 deg to 45 deg. 00:40 End Pitch Program Redstone reaches 45 deg pitch. 01:24 Max Q Maximum dynamic pressure ~575 lbf/ft² (28 kPa). 02:22 Tower Jettison Escape Tower Jettison, no longer needed. 02:24 Spacecraft Separation Posigrade rockets fire for 1 s giving 15 ft/s (4.6 m/s) separation. 02:35 Turnaround Maneuver Spacecraft (ASCS) system rotates spacecraft 180 degrees, to heat shield forward attitude. Nose is pitched down 34 degrees to retro fire position. 05:00 Apogee Apogee of about 115 miles (185 km) reached at 150 miles (240 km) downrange from launch site. 05:15 Retrofire Three retro rockets fire for 10 seconds each. They are started at 5-second intervals, firing overlaps. 550 ft/s (170 m/s) is taken off forward velocity. 05:45 Retract Periscope Periscope is automatically retracted in preparation for reentry. 06:15 Retro Pack Jettison One minute after retrofire retro pack is jettisoned, leaving heat shield clear. 06:20 Retro Attitude Maneuver (ASCS) orients spacecraft in 34 degrees nose down pitch, 0 degrees roll, 0 degrees yaw. 07:15 0.05 g (0.5 m/s²) Maneuver (ASCS) detects beginning of reentry and rolls spacecraft at 10 deg/s to stabilize spacecraft during reentry. 09:38 Drogue Parachute Deploy Drogue parachute deployed at 22,000 ft (6.7 km) slowing descent to 365 ft/s (111 m/s) and stabilizing spacecraft. 09:45 Snorkel Deploy Fresh air snorkel deploys at 20,000 ft (6.1 km). (ECS) switches to emergency oxygen rate to cool cabin. 10:20 Landing Bag Deploy Landing bag deploys, dropping heat shield down 4 ft (1.2 m). 10:20 Fuel Dump Remaining hydrogen peroxide fuel automatically dumped. 15:22 Splashdown Spacecraft lands in water about 300 mi (480 km) downrange from launch site. 15:30 Rescue Aids Deploy Rescue aid package deployed. The package includes green dye marker, recovery radio beacon and whip antenna. ^ The previous three Mercury-Redstone flights were the unmanned Mercury-Redstone 1A, Mercury-Redstone 2 (which carried a chimpanzee), and Mercury-Redstone BD, an unmanned flight with a "boilerplate" (non-production) Mercury capsule. ^ All local times quoted here are in Eastern Standard Time, as Florida did not observe daylight saving time until 1966. ^ Swenson Jr., Loyd S.; Grimwood, James M.; Alexander, Charles C. (1989). "11-1 Suborbital Flights into Space". In Woods, David; Gamble, Chris (eds.). This New Ocean: A History of Project Mercury (url). Published as NASA Special Publication-4201 in the NASA History Series. NASA. Retrieved August 15, 2017. ^ Shepard, Jr., Alan B.; Slayton, Deke; Barbree, Jay; Benedict, Howard (1994). Moon Shot: The Inside Story of America's Race to the Moon (1 ed.). Kansas City, MO: Turner. p. 383. ISBN 1878685546. ^ Hammack 1961, pp. 73–77. Hammack, Jerome B. (1961). "Postlaunch Report for Mercury Redstone No 3" (PDF). NASA. Catchpole, John (2001). Project Mercury: NASA's First Manned Space Programme. Springer Praxis Books. ISBN 1852334061. Wikimedia Commons has media related to Mercury-Redstone 3.